Daemons, walking corpses, teenage sorcerers, and self-professed minions of Satan – it’s all in a days work for the Tri-county Sheriff’s Department out of Haileyville, New York. 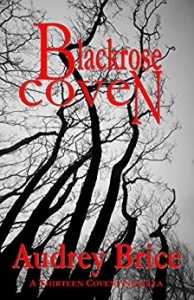 Keeping the supernatural off the official record and under the news radar isn’t an easy job, but Sheriff Steve and the other members of the Blackrose Coven are oath-bound to make sure the Thirteen Covens peacefully co-exist. Now, something dark is rising and things are spiraling out of control. This is the intro to THIRTEEN COVENS: Bloodlines (Book Two). While Bloodlines 2 won’t be out until 2019, those of you who have been following the covens can follow along and read each coven’s story as it’s released. There are six more stories in Bloodlines after this one! To learn more about Thirteen Covens CLICK HERE. This entry was posted in Audrey Brice, books, Magick, news, novels, the writing life and tagged #thirteencovens, Bloodlines, coven, thirteen covens, witches by Steph. Bookmark the permalink.